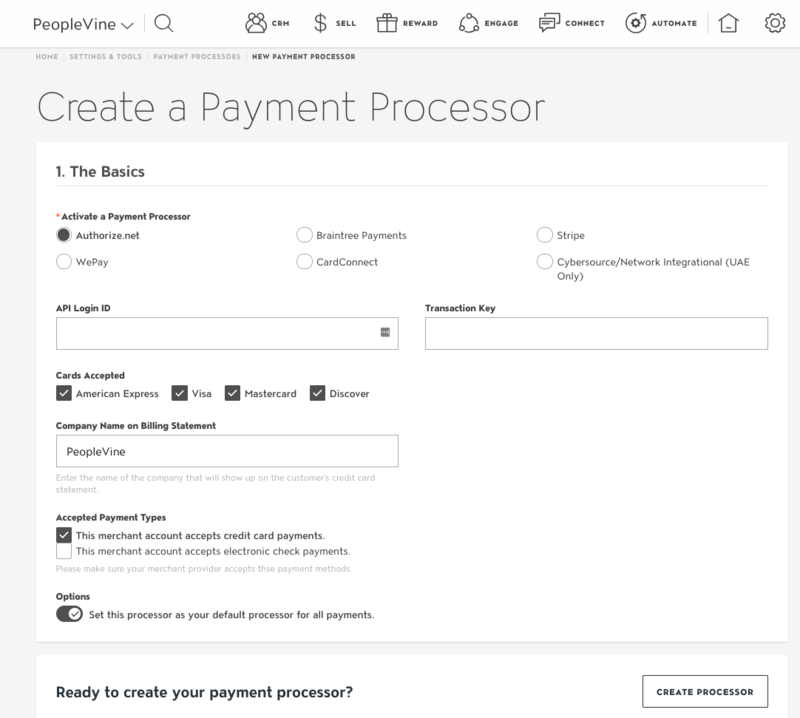 Accepting & Processing Payments in PeopleVine is critical to your success on our platform. Get transactions up an running in seconds. Where can I accept Payments? PeopleVine is ready to start accepting payments immediately and we're already integrated with your favorite payment processors. In order to start accepting payments in these sections, you must activate a default payment processor. PeopleVine currently supports a handful of payment processing providers to enable payments. Start by setting up an Authorize.net account here. Follow the steps here once your account is approved. Visit www.braintreepayments.com to sign up. They are integrated strictly as a processor and no customer data or other info is shared with them. PeopleVine is the platform to manage all your billing, customers, etc. They are integrated strictly as a processor and no customer data or other info is shared with them. 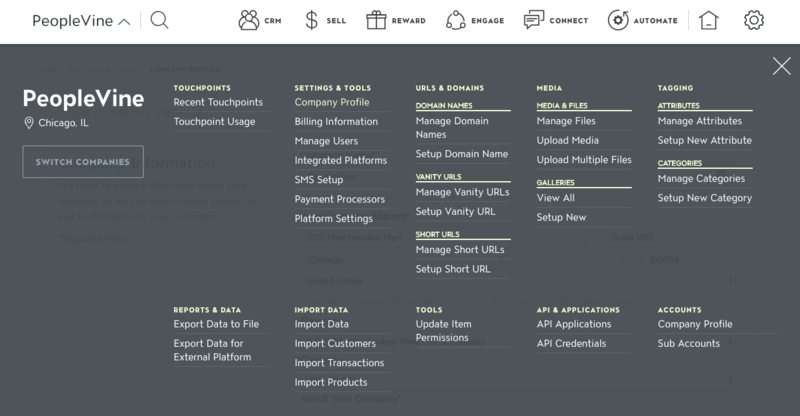 PeopleVine is the platform to manage all your billing, customers, etc. Follow the steps here once your account is live. we integrated WePay to support split payments. Setup unlimited split payments across the board (e.g. you get 10% and your vendor gets 90%)To setup an account visit WePay.com and then authenticate within PeopleVine Integrated Platforms. currently only for eCommerce checkout (you must also have one of the providers enabled too) Follow the steps here to configure PayPal in PeopleVine. Once you have setup your payment processor, log into PeopleVine, and navigate to the control panel by click the ⚙ cog icon on the right hand side. Select Payment Processors under Settings and Tools. From this panel you will be able to add your payment gateway to your PeopleVine account and begin processing payments. 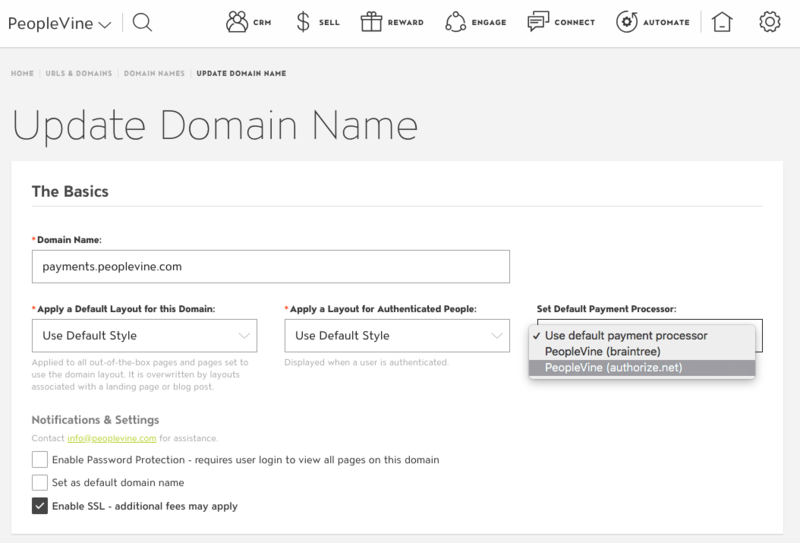 PeopleVine allows you to use multiple payment processors by assigning a processor to a domain. In order to setup a second payment processor you will need to configure a secondary domain name or a subdomain for your default domain. When configuring your secondary domain name or subdomain assign your new payment processor to this new domain. You can now accept payments from a secondary domain name or subdomain on your account. *Be sure that you have an SSL Certificate before completing this step.